In the upcoming sale of classic and new series costumes and props at Bonhams, there is sadly only one item from Jon Pertwee’s era up for sale. This got me thinking, and I looked back over past auctions and found a couple more items worth sharing. A complete outfit and sonic screwdriver, comprising: black cape coat, of wool, with plastic buttons to front, satin lined having large pockets inside, labelled "Angels & Bermans", together with a black watered silk cravat, a burgundy velvet jacket, with black watered silk effect edging and cuff detail, with wooden and plastic buttons with metal thread with black wool lining labelled inside "A. Grofs, KEIL-G" and a "sonic screwdriver" of silver painted aluminium with red, white and black edged buttons. This costume was used for exhibition and promotional purposes and did not feature in the television series. Jon Pertwee took The Doctor in a different direction from the "Cosmic Hobo" and decided to portray a Dandy, but with a difference. He was a master of Venusian Karate and became the James Bond version of the Doctor with his marvellous gadgets and quick wit. 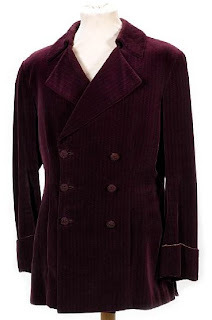 Instead of the hairy coat or Victorian tailcoats he opted for deep purple velvet jackets, cape and scalloped shirtfronts. When Jon Pertwee auditioned for the role as the Doctor in 1969, he wore his father's velvet smoking jacket and the production team decided that it should become a permanent feature of his wardrobe. This was the only jacket made, and worn, for 'Planet Of The Daleks'. The tailor himself saw the jacket in 2007 and confirmed this to be the case; there was no spare or stunt jacket. Pertwee retained it after filming and kept it until the early 1990s. Close inspection of the programme shows several clear onscreen matches to the jacket i.e the loose thread on one of the left cuff buttons, the pattern in the velvet and the detail of the stitching to the lining. 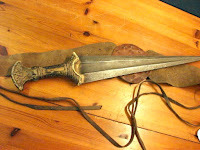 A complete Sea Devil costume from Dr. Who, 1972, as used in series nine, with Jon Pertwee as the Doctor, one of the original suits as featured in the series, the costume of mixed media complete with string vest, belt and a replica weapon, being sold together with letter of provenance detailing the acquisition of the item. "The Sea Devils" is regarded as one of the classic Jon Pertwee, Dr. Who episodes. At present time this costume is believed to be the only existing Sea Devil outfit from the original episode. It was also used for photo-calls to publicise season nine of Doctor Who and was also included in the Doctor Who exhibition in 1997. The vendor purchased this costume in 2001. While search back though some old autions on the Cameo website, I came across a sale in March 2010 which I didn’t know about! It has over a dozen items, again ranging right back to William Hartnell’s earliest seasons, including ONE minor item from Jon Pertwee’s era. 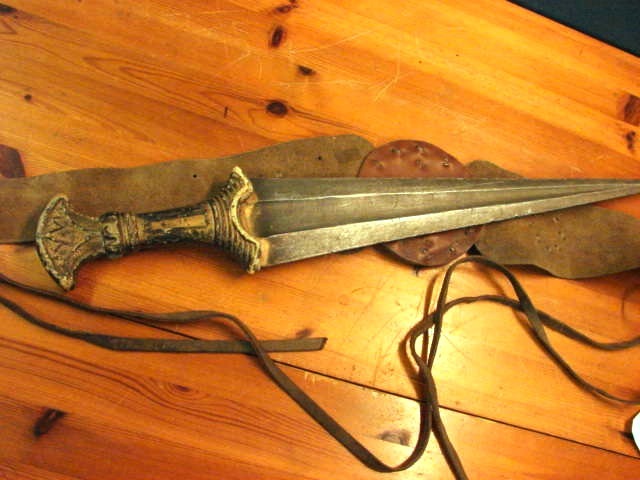 A Leather belt and faux Roman Sword used by James Mellor as Varan.